This wide-ranging portrayal of the recorded works is interlocked by way of a presentation of the music on a most remarkable pianoforte, namely the Erard grand once owned by Wagner himself during his sojourn at Tribschen near Lucerne. 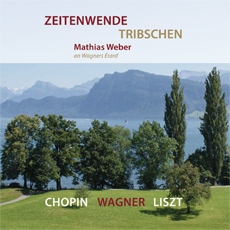 In a particularly convincing way pianist Mathias Weber succeeds in eliciting from the instrument every nuance of tone in all its shades and gradations by means of his extremely sophisticated key-stroke in such a way that a colourful acoustic image arises before one’s inner eye. Thus it is hard to believe that such an aged instrument as Wagner’s Erard grand – thanks to Weber’s finesse of performing and due to the seemingly inexhaustible tonal potential of the piano – is indeed capable of producing a nearly inaudible, but nevertheless clearly perceptible delicate pianissimo. – So Liszt’s Jeux d’Eaux , e.g. are coming out in an almost incomparable way on this pianoforte, because it owns such an enormous range of timbre that quite inevitably an image of sprightly sparkling fountains is set free in the listener’s imagination. Hence one can literally hear the murmuring and foaming of the waters, one can easily visualize the glare and the iridescence in the refraction of the drops against the glistening light of the Italian sun.